The three Falcon 9 first stages that SpaceX has successfully brought back down to Earth sit in a hangar at Kennedy Space Center’s Launch Complex 39A on May 14, 2016. New SpaceX photos show three big pieces of spaceflight history sitting side by side by side. 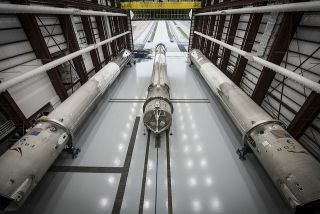 The images, which were taken on Saturday (May 14), show the three Falcon 9 rockets that SpaceX has successfully brought back to Earth arrayed next to each other in a hangar at Launch Complex 39A, which is part of NASA's Kennedy Space Center in Florida. Shot of SpaceX’s three landed Falcon 9 first stages in a hangar at Kennedy Space Center’s Launch Complex 39A. Photo taken May 14, 2016. SpaceX is working to develop fully and rapidly reusable rockets, technology that Musk has said could reduce the cost of spaceflight by a factor of 100. The three boosters in the hangar at 39A — which are the big first stages of the two-stage Falcon 9 — are part of that development effort. The other two Falcon 9 first stages came down at sea, landing on the deck of a robotic ship called "Of Course I Still Love You" that SpaceX had stationed several hundred miles off the Florida coast. Close-up view of one of SpaceX’s three landed Falcon 9 first stages. Photo taken inside a hangar at Kennedy Space Center’s Launch Complex 39A on May 14, 2016. SpaceX would prefer to land all of its rockets at or near their launch sites, to streamline inspection and re-launch processes. But boosters cannot carry enough fuel to make it all the way back during some liftoffs, which explains why the company is practicing ocean landings as well, Musk has said. The Falcon 9 that landed in December will be put on display at SpaceX's headquarters in Hawthorne, California, perhaps as early as next month, company representatives have said. Musk has said that SpaceX plans to refly the rocket that came down in April, and the same fate presumably awaits the booster than lofted JCSAT-14 as well. Long shot of SpaceX’s three landed Falcon 9 first stages, taken from outside a hangar at Kennedy Space Center’s Launch Complex 39A on May 14, 2016. JCSAT-14 went to geostationary transfer orbit, which is much farther away than low Earth orbit, where the ISS flies. So the rocket that landed on May 6 hit Earth's atmosphere while traveling about twice as fast as the one that came down on April 8, company representatives have said. "Most recent rocket took max damage, due to v high entry velocity. Will be our life leader for ground tests to confirm others are good," Musk said via Twitter Sunday.